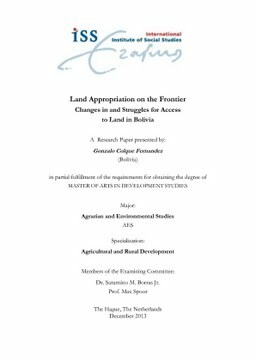 The aim of this research paper is to explore the political economy of contemporary land appropriation on the frontier context where the Bolivian state has no convincing authority and its role is systematically challenged by regional elites. By engaging with the literature on contemporary forms of dispossession, research questions revolve around appropriation of public land for production of flex crops and commodities, the role of the state within these dynamics and in what way landless and poor peasants are affected. The study explores the expansion of agriculture lands suitable for oilseeds production (mainly soya) in Bolivian lowland—Santa Cruz, stressing its significance in the national context. The pa-per argues that although internal pre-existing land disputes played an important role, the rise of land commodification responds to processes of capital accumulation and global crisis. It also provides an account of political struggles, the role of the state to carry out land distribution and its dilemmas. Finally, it high-lights the denial of land and exclusion of landless and poor people as a key condition of capitalist farming where transnational capital is strongly involved.